“Most of our members are first-time gym users who aren’t looking to be body builders or the next Miss America,” said marketing manager Sarah Wilson. “We offer an inclusive, non-intimidating environment. Our staff goes out of their way to make our members feel comfortable,” she said. Planet Fitness is a franchise started nearly 20 years ago and now has 1,742 locations worldwide. Wilson works for a corporation called Impact Fitness based in Brighton, Michigan, which owns 26 Planet Fitness franchises primarily in Michigan, Indiana, with a couple in British Columbia. Impact Fitness now has its sights on Ontario, having opened a Windsor location last week. 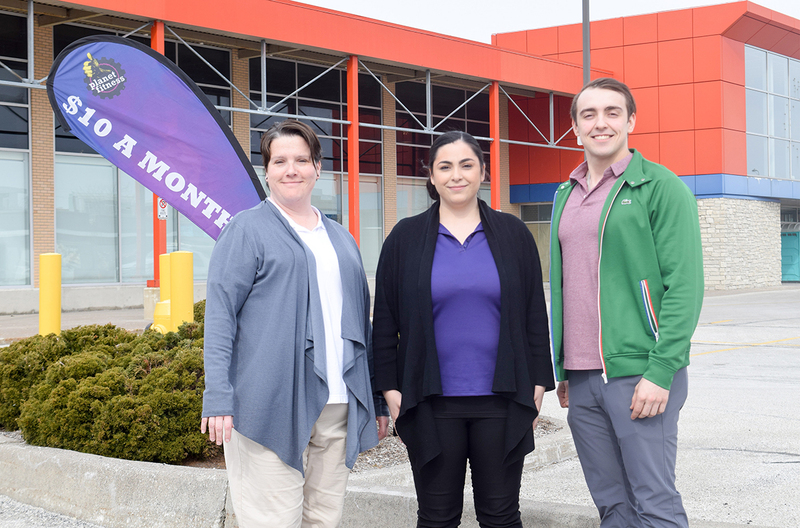 The opening of Sarnia’s Planet Fitness in expected in late May or early June. Generally, about $2 million is spent on renovations and equipment before the doors open at each gym, said Wilson. Planet Fitness is located at 1330 Exmouth St., in a large plaza that lost all of its tenants several years ago. It was formerly occupied by an LCBO, a men’s clothing store and a grocery store. The new gym will be 21,880 square feet and offer cardio machines, locker rooms, showers, televisions, and a 30-minute express circuit. A variety of hour-long fitness classes are also included in a basic membership selling for $39 a year, plus $10 a month. Those who wish to upgrade to $21.99 a month, also get access to every Planet Fitness (there are two dozen in Ontario), as well as amenities like tanning beds and massage chairs. In the weeks prior to opening, the $39 annual membership fee is reduced to $1. Those low prices are part of Planet Fitness’ attempt to be a gym for everyone, especially beginners, said Wilson. Planet Fitness clubs average 7,000 members and Sarnia’s is expected to be the same, Wilson said. It will be open and staffed 24/7 and have a certified fitness instructor at the gym Monday to Friday. About 15 full and part-time employees are being hired. For more information, including Sarnia job postings and online memberships, visit www.PlanetFitness.ca. It’s also possible to join in person at the presale office at 1330 Exmouth St. open seven days a week. Got a great business story idea? Send it to cathy.dobson@thesarniajournal.ca.